So you’re booked to come stay in one of our beautiful hotels. Playa del Carmen is on your mind and you’re looking forward to relaxation on the beach or doing one of the multiple activities found in the Riviera Maya. You get on the plane, and the flight attendant mentions that they will soon be passing out customs and immigration forms. If it is your first time leaving the country, this could be a confusing and possibly stressful situation. Don’t worry, though. I’m here to help you out and quell those nerves! The Mexican immigration form is to be filled out on the plane, since in many cases there will be a person checking these as you exit and will stop you for this info immediately. 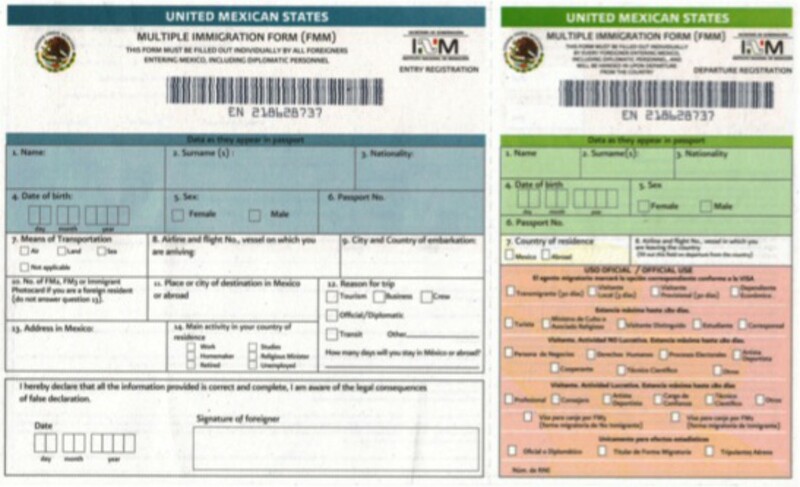 There are two parts to the immigration form and you will fill out each side. When you walk up to one of the many immigration counters you will provide them only with this form and your passport. They will stamp the form and return the small half and tell you to proceed. This is your temporary visa to be in the country and it is important to save this as you will need it to exit the country as well. The airline person who checks you in upon your departure will ask for the form, and will not let you leave without it. If you do lose the form, you simply go to the immigration desk and request a new one, but if it is busy and you’re running late for your flight there is a good chance you may miss it. This can be a huge inconvenience and can damper the last minutes of your well-needed vacation. It is best to just keep your immigration form with your passport, as you will need to display both to the airline attendant when leaving, and the paradise can still be on your mind – so yes, it’s easy to get distracted. The second form is the customs form. Only one form per family is necessary. Once you pass through immigration you will go to pick up your luggage and proceed to customs. In most situations the luggage will be put through an X-ray machine where you’ll pick it up on the other side, present your customs form, and go through the traffic light as a random search method. The person who hands the customs officer the form will be asked to push the traffic button, if the light displays green you move on. If the light displays red, you will be asked to put your luggage on a counter for an officer to do a baggage check. We look forward to seeing you soon and hope you’re trip into and out of the country is an easy one. The most beautiful hotels Playa del Carmen has to offer are waiting for you! !